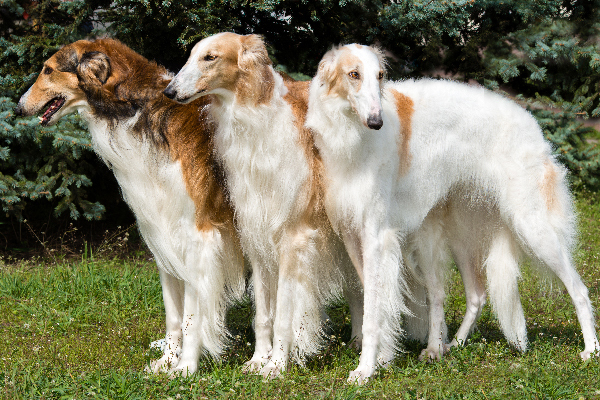 Borzois have tall, slender frames covered in silky, medium-length coats that come in bronze, white, tan, gray or any combination of those colors. Their long, thin heads have rounded skulls, dark eyes and ear that lie back on their necks. Their thick, powerful necks lead down to narrow chests, long backs and long tails that hang low. Overall, the Borzoi possesses a rugged but stylish grace. 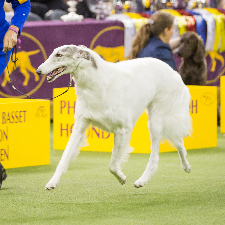 Borzoi. Photography by Kayla Bertagnolli, as captured at the 2018 Westminster Kennel Club Dog Show. The Borzoi is loving, kind and gentlemanly. Around the house, she has a calm nature and impeccable manners. She feels an intense loyalty to her family and can be somewhat easy to train. 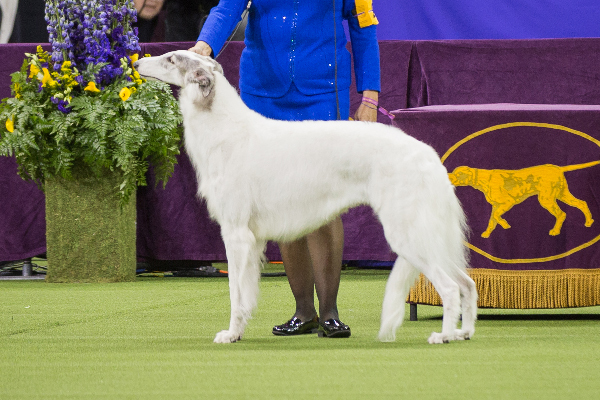 But the Borzoi has a serious and independent side. She also appreciates calm, quiet and peace. Because they don’t wrestle or goof around much, Borzois might not enjoy spending too much time with small children. Protective and loyal, Borzois are good watchdogs with an excellent sense of restraint. Borzoi. Photography ©volofin | iStock / Getty Images Plus. Borzois are born and bred hunters. Make sure they get lots of vigorous walks, and always keep them on a leash. They are superb jogging partners, but don’t push them too hard in hot weather. Borzois can live as long as 12 years. Generally healthy, some may have problems with bone fractures. Borzois are also prone to bloat: Feed them smaller portions instead of one big daily meal. Fairly easy to groom, Borzois need only the occasional brushing. However, they do shed during the spring and fall. Also known as the Russian Wolfhound, the Borzoi was developed by Russian nobles hundreds of years ago to hunt wolves. A rugged and utilitarian breed during the Renaissance years, the Borzoi became a fashionable hunting-party dog in the 19th century. Though today’s Borzoi is a popular pet, some are still employed for their hunting and guarding skills.